Search log analysis has become a common practice to gain insights into user search behaviour: it helps gain an understanding of user needs and preferences, as well as an insight into how well a system supports such needs. Currently, log analysis is typically focused on low-level user actions, i.e. logged events such as issued queries and clicked results, and often only a selection of such events are logged and analysed. However, types of logged events may differ widely from interface to interface, making comparison between systems difficult. Further, the interpretation of the meaning of and subsequent analysis of a selection of events may lead to conclusions out of context— e.g. the statistics of observed query reformulations may be influenced by the existence of a relevance feedback component. Alternatively, in lab studies user activities can be analysed at a higher level, such as search tactics and strategies, abstracted away from detailed interface implementation. Unfortunately, until now the required manual codings that map logged events to higher-level interpretations have prevented large-scale use of this type of analysis. In this paper, we propose a new method for analysing search logs by (semi-)automatically identifying user search tactics from logged events, allowing large-scale analysis that is comparable across search systems. In addition, as the resulting analysis is at a tactical level we reduce potential issues surrounding the need for interpretation of low-level user actions for log analysis. We validate the efficiency and effectiveness of the proposed tactic identification method using logs of two reference search systems of different natures: a product search system and a video search system. 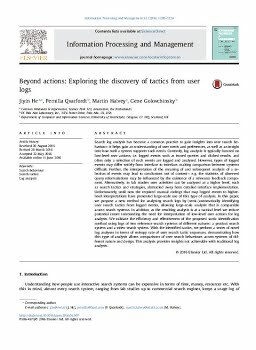 With the identified tactics, we perform a series of novel log analyses in terms of entropy rate of user search tactic sequences, demonstrating how this type of analysis allows comparisons of user search behaviours across systems of different nature and design. This analysis provides insights not achievable with traditional log analysis.